Canada's Jasper National Park September 29, 2013 through October 8, 2013. Niala Branson and I flew from St. Louis, on Delta Airlines, to Minneapolis St. Paul. Changed planes and then continued to Edmonton, Canada where we rented a car and drove four hours to Jasper National Park. Customs was no problem; however we did inventory all our equipment with the US Customs Office one week prior to our flight. It is important that you be able to prove what you took out of the US so that you do not have to pay customs when you bring it back in from Canada, The highway from Edmonton to Jasper was four lane all the way and was in excellent condition. Driving and road signs are the same as in the US. We did have to purchase Canadian money which we did through our local bank. Not all establishments in Jasper would accept US currency. The exchange rate was about 1 to 1 with the US dollar slightly lower than the Canadian money. You need to check with your bank daily because it fluctuates between the two countries daily. We had planned this trip months in advance booking air fare, car rental, and our cabin. The cabins, "Alpine Village", were really nice. Well maintained, with two queen size beds, full bath, and internet service. The main office offered a hot tub and store. We were only a few miles from downtown Jasper and were right on the Athabasca River. It was not uncommon to walk out the door and see Elk grazing on the lawns. I should mention that the lawns and landscapes were well taken care of. I took a lot of pictures and this is just a sampling of them. This presentation is in journal format so be sure and scroll through all of them. Hope you enjoy this presentation and email me if you have any questions concerning our trip or how I processed any of these photographs. Please use the contact form provided with this Smugmug Gallery. Sunwapta Falls 10/01/2013: We arrived very early and were the only ones there. It was cold and spitting snow. 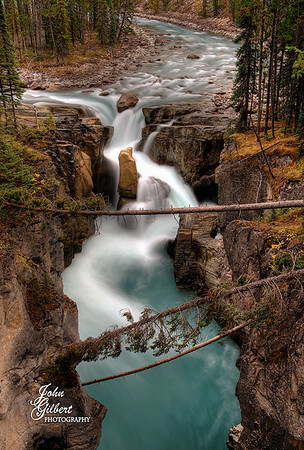 The falls is fed by the Sunwapta River coming from the Columbia Icefield. Nikon D600, 24-70mm lens @38mm. Aperture f/8, Shutter Speed 1.6; 1.0; 2.5; seconds, ISO 200, and 0EV; -0.67EV; and +0.67EV. This consisted of three separate shots blinded together in PS6. Tripod.